D Tibbets wrote: PS: I don't know the limits of copper. When transformer windings, electromagnet windings, etc. are chosen, given a certain quality of copper wire, are the engineers limited more by global heat isues or by local limitations where these defects/ contaminates/ choke points occur? Generally, big resistive lab magnets are made of square copper tubing with coolant running through the center. 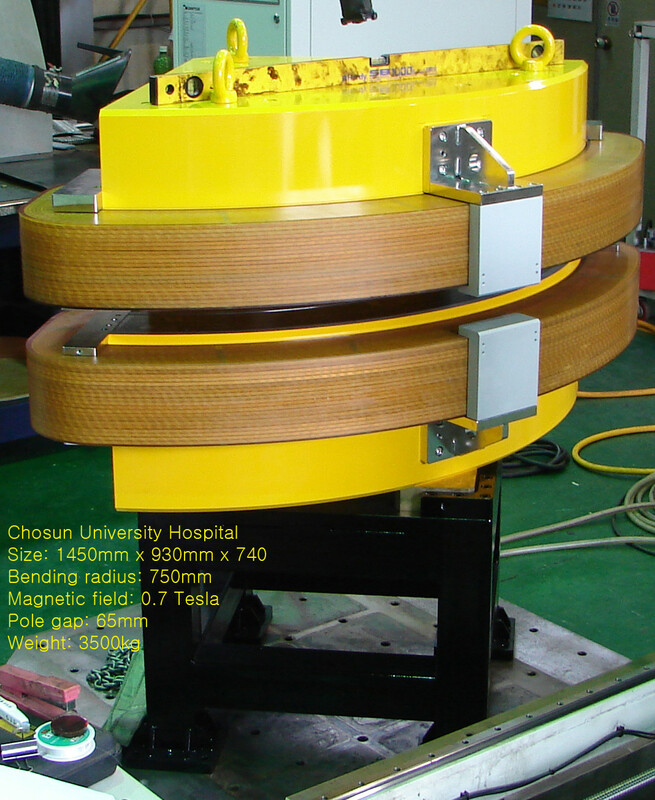 Attached is a random google image search result of a typical bending magnet for a beamline. For a magnet. all you really care about is the number of amp turns at the end of the day; everything else basically works out backwards from there. For a given number of amp-turns, you get a given resistive waste heat for a given copper alloy (any decent coil will use the electrical grade 101 alloy). This is basically constant; more turns of thinner wire increases the voltage and resistance and reduces the current, fewer turns of larger wire reduces the voltage and resistance and increases the current. It basically washes out. Here the hard limit becomes your power supply which have some bound on reasonable voltages and currents available. To remove that given waste heat, you need a given mass flow of coolant. You get the same sort of trade off here. More turns of thinner wire increases the pressure needed while fewer turns reduces the pressure needed. Here the hard limit is hitting turbulent/choked flow with long lengths of small pipe diameters. It is not good if your coolant starts to boil before it makes it out the other side of the coil. This is where pulsed magnets can excel. In that case, heat rejection does not matter. Heat capacity and structural integrity become the main concern. Here, you can use thinner and thinner wire with higher and higher voltages until the inter-winding magnetic forces literally rip the magnet apart. So overall, you want lots of turns of thin wire so you don't need stupidly high currents and balance that with a reasonable pressure drop to allow non-choked flow coolant of through the coil which pushes you back towards fatter tubes. Like you said, for a steady-state electromagnet it is all about the conductivity of the material (read: resistive losses); micro-defects are not an issue at all in the real world at macro scales. prestonbarrows wrote: Generally, big resistive lab magnets are made of square copper tubing with coolant running through the center. Attached is a random google image search result of a typical bending magnet for a beamline. In a commercially pulsed machine, getting rid of heat would still a huge factor as the pulses are going to be in very rapid succession? Why would high current -- for a low turn magnet -- be a bad thing? Is this a power supply issue? Or maybe it's a problem to get that power to the magnets (transmission issue)? With a bitter-style magnet we'd run the coolant through holes in the side of the conductor plates - so it's low pressure and coolant does a quick round-trip through the system. Better descriptions of practical considerations driving magnet design are appreciated. Bitter magnets have been discussed before, though I don't know if they lend themselves to the B field geometry desired. The issue of electrical conductivity for this composite versus copper seems to be the confounding issue in this thread. Look at the charts with the article carefully. One shows electrical conductivity versus temperature. Above 80 degrees C the composite may have a modest advantage. Below 80 a disadvantage. I don't know if this extends into the cryogenic range. Copper electrical conductivity may be ~ 6-8 times better at liquid nitrogen temperatures and ~ 20 times better at liquid helium temperatures. This does eat into the superconductor advantages and avoids quenching concerns, and as pointed out allows for rapid pulsating of magnet strength through small or large ranges that might have some advantage for managing plasma properties, facilitating electron injection, POPS effects, etc. Another chart shows the electrical conductivity versus current in millions of Amps per cm of thickness. The important points here is that below a few million Amps per 1 cm thickness, the two materials are essentially the same. Only above this current density does the composite show it's advantage. The appreciation of what this means is to consider what the thickness ofthe wire is. A one cm wide wire (square wire) is 1 square cm in cross section. A 1 mm wire is 0.01 square cm in cross section. It is one tenth the diameter but the cross section is one hundredth of a 1 cm wire. This exponential relationship between diameter and cross sectional area is what leads to smaller and smaller wires having current carrying wire that decreases as the square of the diameter. Eventually, a tiny wire will exceed the current carrying capacity represented by the graph. Then the differences between the materials becomes significant. This transition for copper is at ~ 3 million Amps in a 1 cm wire. In a one micrometer wire it is the square of the difference in diameter or (0.0001) ^2 less or 0.00000001 times less. This 1 micrometer diameter copper wire could carry only about ~ 3 * 10^-2 or about 10 milliamps. Any current higher than this results in the copper wire heating much faster because the electrical conductance is decreasing rapidily- the resistance is increasing rapidly. The cooling requirements quickly becomes unmanagable. The composit with this transition occurring at ~ 100 times greater could carry about 1 Amp through a one micrometer wire before the cooling requirements ran away. Keep in mind that the resistive heating for both grow about the same below this critical temperature, only past these threasholds does the comparitive resistance diverge. It is almost like comparing a superconductor that works at 4 degrees K versus one that works at 80 degrees K. If you cannot keep the wire below quenching temperature it fails . It is easier with the high temperature superconductor. Compared to the copper and composite wire the situation is similar, only the baseline resistivity and the rapidity of slope change with quenching. This comparison is between 1 cm and 1 micrometer wires. Shrinking the wires to 100 nanometers would decrease the current carrying capacity of the two wires further by 100 X. Now the composite wire could carry ~ 10 milliamps before heating concerns become tremendously more difficult. Hopefully my math has been reasonable. Just remember that the current carry capacity decreases as the square of the diameter. I think this applies to any wire weather superconducting or not. Practical human scale applications probably never reach current densities where the advantage of the composite is reached. Because of the exponential relationship this is not the case on the nano scale. As the authors point out this nano scale realm is where this recipe us useful, perhaps very useful. Can anyone give an example of an application where wire dimensions of perhaps 1 mm or greater require current densities where the electrical conductivity of this composite wire diverges from that of copper (ignore the mild high temperature advantage of this composite, that is a sort of different issue; just as the possible advantage of copper at cold temperatures is ignored)? Cooling considerations limits the current for both about the same in this macro realm, so there is no advantage. Questions of strength, rigidity, high temperature tolerance, cost, etc. are different engineering issues that may change the picture also. Tyler Jordan wrote: In a commercially pulsed machine, getting rid of heat would still a huge factor as the pulses are going to be in very rapid succession? The extreme pulsed magnets I mentioned earlier are only really used for single shots or extremely low duty cycles. They are usually used for things like magnetic pulse welding in the real world. If you push through another pulse before the thermal energy of the previous pulse dissipates, the temperature would start to run away. Tyler Jordan wrote: Why would high current -- for a low turn magnet -- be a bad thing? Is this a power supply issue? Or maybe it's a problem to get that power to the magnets (transmission issue)? If you want steady state, you run into major practical engineering issues beyond 500 or 1000 Amps or so. First, you need a power supply that can output that current. It is very difficult to make a supply that can output more than a few hundred amps; all the internal wiring needs to be big fat bus bars and you end up needing huge arrays of parallel components. You can cheat a bit by ganging up a number of supplies in parallel, but beyond a few units you start hitting stability issues. Even assuming you have a black-box power supply that will spit out 1000 Amps, transporting that to you load is not trivial. Take a look at the current rating of standard copper wires. Even the largest can only carry about 250 amps. Again, you have to end up stringing a whole bunch in parallel or use water cooled bus bars as the transmission lines. This is doable, but at this point the wiring alond starts to become its own little industrial facility. You will never be able to get, say, 100,000 amps steady state; there is some practical ceiling. Tyler Jordan wrote: With a bitter-style magnet we'd run the coolant through holes in the side of the conductor plates - so it's low pressure and coolant does a quick round-trip through the system. Draw up a plan for a toridal Bitter magnet. You will see the design does not work for circular cross sections. Maybe the magnetic strength benefits would out weigh the square cross section, but it is not immediately clear. Bitter magnets only excel when you use them for long solenoids. I agree with your last post. This composite seems much more beneficial for transistor scale applications. On macro-scales, you will hit the thermal limit of copper before the ampacity limit in steady state. Extreme pulsed magnets may benefit from this composite as it is possible to run into the ampacity limit before any heat can be rejected. For pulsed, if the peak current is too high the coil wire eats it self; increasing temperature increases resistance and runs away until the copper is literally turned into a plasma. Reducing the resistance would limit this effect. If you limit the peak current to levels that don't melt the copper (or composite) directly, you need to worry about mechanical stress from the huge dI/dt which acts to push each turn away from the other and rip the coil apart.